In my article Budgeting: How To Create A Budget, I discussed the benefits of having a budget and also steps to setting up one. In this installation, I will elaborate on some tips on setting up achievable goals which can be attained with the aid of your budget. A candid observation will be you can set any number of goals to accomplish with the help of your budget. But it is imperative to be conscious of the fact that the goals need to be realistic and attainable. Here, I have listed some tips on setting simple goals which can be achieved with your budget. 1. Plan out the allocation of your income. Try to follow the rule of putting away some money for your expenses and a little sum for guilt-free play money while the residue (the lion’s share of your aggregate income) going towards a savings account. Sit down and make a list of your priorities and then try to spread out the income into appropriate boxes labelled with titles like household expenses, rent or mortgage, debts, holiday etc. 2. Always put away some cash for an emergency fund. An emergency fund ensures that you have a safety net in cases of unprecedented emergencies. An emergency fund can act as a good Samaritan in rescuing you from debts, investment losses or unforeseen events like illnesses and accidents. Alternatively, an emergency fund can be viewed as a cash stash or savings for future to help you attain that car you always wanted or finally accumulating a down payment for a house. 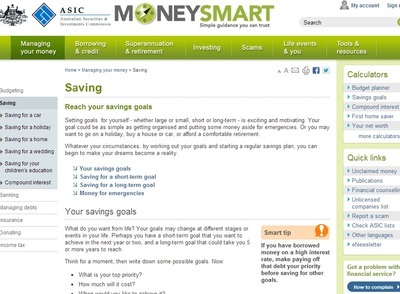 Learn more about saving money by visiting the MoneySMart website administered by ASIC. 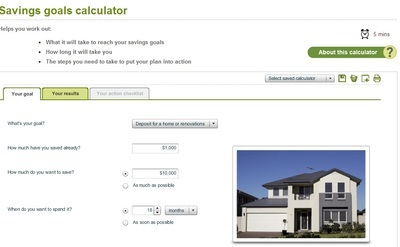 And once there, have a look at their savings goals calculator. 3. Make paying off your debt a priority in your life. 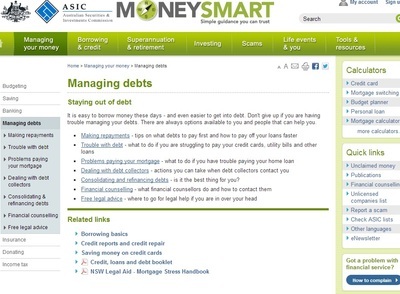 Knocking out debts and paying off your creditors will deter you from paying your hard-earned money towards interest. Reducing debt is also a contributory factor in your financial well-being as well as your mental and physical well-being. 4. Set up an automated savings plan using your bank accounts. The beauty of an automated savings plan is that depending on the frequency chosen by you, a nifty sum of money will be siphoned off from your transaction account every week, fortnight or month to your nominated savings account. You do not have to think or be conscious of saving money manually every now and then. An automated system will take the burden off your shoulder and help you in building a nice, little nest egg. An automated savings plan can supplement an emergency fund, as postulated in item 2. Shop around for a high interest earning bank account. 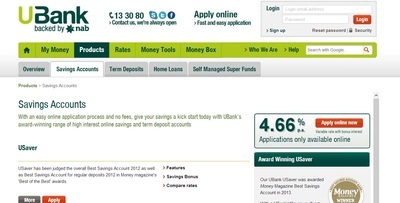 Have a browse of the Ubank website and check out their lucrative savings account interest rates. 5. Spend less than you earn. This is the golden rule in saving money and maybe oneday, growing rich. The main goal of your budget should be to aid you in living within your means. Remember to be realistic with your goals and the timeframes and don’t make it too onerous on yourself to reach your targets. Best street food in Melbourne?